The Karenza Spiritual Network is delighted to welcome Bernie Scott to Cholsey on Monday 7th March 2016 to celebrate our 2nd anniversary with “A Charity Evening of Mediumship with Bernie Scott”. The evening starts at 7.30pm, entry is £8 on the door and all profits will be donated to the 2 most popular charities voted for by you on the night. 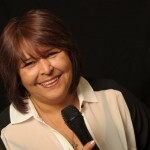 Award winning medium Bernie Scott has demonstrated her gift of mediumship in Spiritualist churches, halls and theatres. As an international medium she has worked in many countries including the USA and Canada. She has written for and been featured in several esoteric publications, including Silent voices. Bernie has also been featured in popular magazines and interviewed on many radio shows including The BBC. Bernie is very much in demand and her evenings are quite often sold out. We hope you can join us for a great evening of spirit communication!